Tashi Mandala Motel >>> Lhasa, T.A.R. A day before their echocardiogram screenings the children are visited at their motel guesthouse by Kelly Handy, the local coordinator of the expedition. The children and their families have just returned from the temple, where the kids received blessings (note the ash on their noses) to protect them through the unknown of the coming days. Besides never having been to the city before, the children and their families do not know what to expect from tomorrow's hospital visit. 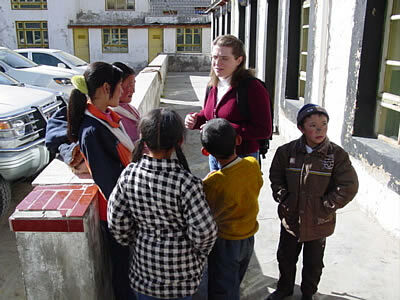 That visit will determine an exact diagnosis for each child, the nature of which will further determine if local treatment is possible in Lhasa, or if travel to Beijing is required for a more intensive procedure.